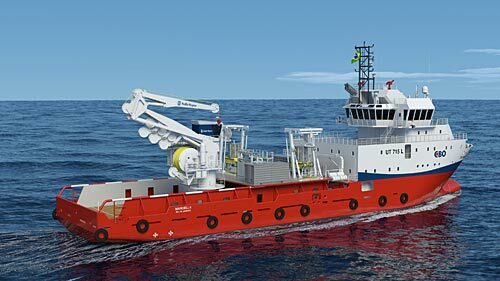 Rolls-Royce has been assigned by the Brazilian ship owning company CBO to equip an existing offshore platform supply vessel (PSV) with a new patented dual draglink (DDC) subsea crane. This will be the first installation of a subsea crane designed to be able to use either fibre or steel wire rope. The hybrid DDC subsea crane will be installed on the vessel CBO Manoella, which is currently being retrofitted from PSV into a ROV Support Vessel (RSV). The active heave compensated crane is designed for continuous operation in a tough and corrosive offshore environment with focus on efficient and safe load handling. The crane to be installed on CBO Manoella is a hybrid dual draglink crane with a lifting capacity of up to 50 tonnes and an operating depth of up to 3,000 metres. It will be equipped with wire rope when it embarks on its first subsea assignment off the coast of Brazil. However the possibility of changing to fibre rope provides flexibility in a challenging market. Because of the low weight of the fibre rope, the vessel’s deck load capacity can be increased by approximately 100 tonnes. Another benefit of using a low weight fibre rope instead of steel wire is increased lifting capacity at large depths. The cable tractions control unit (CTCU) forms the crane winch and is located at the crane’s main boom. This solution saves space compared to a solution where the CTCU unit is mounted below deck, and also makes it a better choice for retrofits. The horizontal elbow derrick movements provide Active Heave Compensation (AHC). This significantly reduces wear and build-up of heat in the lifting line compared to when the AHC is part of the winch. CBO Manoella has 76.7 metres overall length, a beam of 17 m, and a gross tonnage of 2668 tonnes. It has a Rolls-Royce UT 715 L design and first went into service in 2009. It was then number two in a series of nine UT 715 L-designs ordered by CBO. Today the vessel is part of CBO’s current fleet of in total 27 offshore vessels, of which 14 are UT-designs from Rolls-Royce. The delivery from Rolls-Royce will take place in Q3 this year. It comprises a complete DDC crane system including the CTCU, cabin and control system.